Feeding: It is not recommended to feed a Yorkshire Terrier any exotic treats because of their delicate digestive system. It is important to feed a Yorkie dry food to help keep tarter from building up on their teeth. Temperament: The Yorkshire Terrier is a brave and adventurous little dog. Yorkies are very loyal and affectionate with their owners, but can be somewhat suspicious of strangers. They may show some signs of aggression toward other dogs or small animals. They are very time demanding of their owners and need lots of attention. Family Dog: Yorkies make great family pets but do best with older children as they may snap if surprised, frightened or teased. Shedding: Yorkies shed little to no hair. 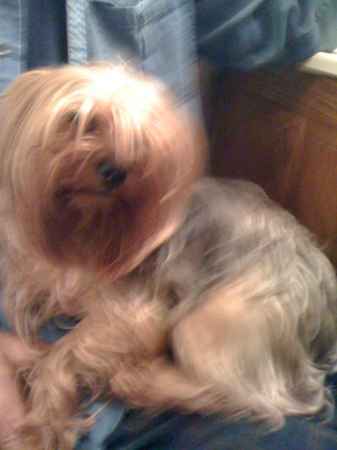 Grooming: Yorkshire Terriers need regular grooming including daily or at least weekly brushing. Training: Yorkshire Terriers are generally easy to train but may prove stubborn at times. Some may be difficult to housetrain. Barking: The Yorkshire Terrier likes to bark. This trait may be able to break with proper training. Weather: Yorkies prefer warm weather or climates and should not be left out in the cold for very long periods of time. Exercise: Yorkshire Terriers love go do on daily walks. Indoor playing will fulfill their exercise requirement but their still have an instinctive need to walk. Living Conditions: Yorkshire Terriers make great dogs for small houses or apartments. They are very active indoors and can get plenty of exercise inside because of their size. Appearance: Yorkshire Terriers are small long-haired dogs with a blue and tan coat that hangs down on each side of their body. They have a small proportionate body and carry their head high and proud. Size: A Yorkshire Terrier should be between 6 to 7 inches tall and must not weigh more than 7 pounds. Head: Yorkshire Terriers have a small head that is flat on the top. Eyes: Yorkies should have medium sized, dark colored eyes that are not too prominent. Their eyes should sparkle in the light and give them an intelligent appearance. Ears: The ears of a Yorkshire Terrier are small and have a v-shape to them. They should be carried erect and not spaced to widely on the head. Muzzle: The Muzzle of a Yorkshire Terrier is of moderate length with a black nose. Yorkies have a scissors or level bite and sound teeth. Body: The body of a Yorkshire Terrier is very compact and proportionate with a level topline. Forequarters: A Yorkie's front legs should be straight. The elbows should be in line and neither in nor out. Hindquarters: The rear legs of a Yorkshire Terrier should appear straight with the stifles slightly bent. Feet: The feet of a Yorkie should be small and round with black toenails. A Yorkshire Terrier's dewclaws should be removed from the hindlegs. Removal of the dewclaws on the front legs is optional. Tail: A Yorkshire Terrier's tail should be docked to a moderate length. The docked tail should be carried just above back level. Color: When born, Yorkie puppies are black and tan in color with a darker body color. Adult Yorkshire Terries will be bluer in color on the body from the back of the neck to the tail with darker blue on the tail. The blue color should appear dark, more of a steel-blue hue than the silvery blue associate with other breeds. The blue coat should be free from any other color mixed in with it. The tan portion of a Yorkie's coat should be a rich tan that is darker at the roots and gradually becoming lighter toward the tips. The tan portion should not contain any black hairs mingled in. Coat: The coat of a Yorkshire Terrier should be of moderate length and straight with a glossy appearance and silky texture. The coat may be trimmed to floor length if necessary. The coat on a Yorkie's head should be long and tied back with a single bow in the middle or parted down the middle a tied back with a bow on each side. The hair on a Yorkie's muzzle should be left long. The hair on the ears and feet should be trimmed short. Life Expectancy: The average life expectancy of a Yorkshire Terrier is 12-15 years. Characteristics: Yorkies make excellent watchdogs. Health: Yorkshire Terriers are prone to bronchitis. They have a low tolerance of anesthetic and delicate digestive system. Yorkies often have trouble delivering pups. Dental Health: Proper care should be taken of a Yorkies teeth as they are prone to early tooth decay. At home brushing and professional vet cleaning is highly recommended. Bone Health: Yorkies are somewhat prone to spine problems and can sometimes suffer paralysis in the hindquarters caused by herniated disks. Because of their small size, Yorkies have fragile bones and care should be taken to make sure they do not suffer any fall, knocks or large jumps to the floor. There is also a chance for abnormal skull formations. History: Yorkshire Terriers have been around for a little over 100 years. Their origin is not well known. They are believed to have been used for catching small animals during hunting or riding rats from mine shafts. Scotsmen are believed to have brought various types of terrier to the woolen mills of Yorkshire. It is believed that these were then crossed with other local dogs and possibly the Maltese, Black & Tan Manchester, and Dandie Dinmont Terriers to create the first Yorkshire Terrier which was bigger than they are today. Yorkshire Terriers were commonly used as 'Fashion Dogs' and carried by women in bags under their arms, which is still done today. Yorkshire Terriers first appeared in a Dog show in 1870.